Through its association with Rip Curl, whose name alone has symbolised surfing since 1969, Citroën is boosting the outdoor spirit of C4 Cactus through a more radical and revealing version. In this way, Citroën is providing this model's fans with a version that is at the same time different, technologically advanced and with a high level of performance, ideal for lifestyles focused on relaxing, leisure and well-being. The Citroën C4 Cactus Rip Curl's major innovation is enhanced traction. Associated with the more powerful C4 Cactus engines, each mated to a manual gearbox (PureTech 110 S&S manual and BlueHDi 100 manual). Citroën’s C4 Cactus Rip Curl Special Edition is the only version to come with Grip Control. The car also features special Mud & Snow tyres to help keep it moving on difficult surfaces. SNOW: to reach the most beautiful ski resorts..
ESP OFF: to deactivate ESP (operational up to 50 km/h). 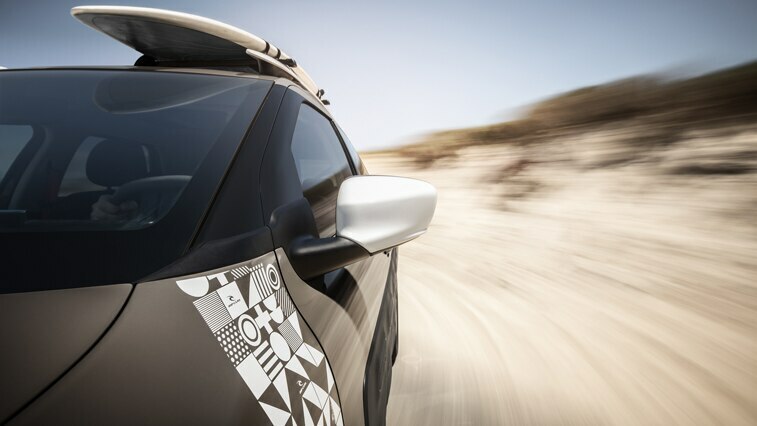 Citroën C4 Cactus Rip Curl's specific look includes : white rear-view mirror housings, white roof-bars and a brilliant-white vertical adhesive strip blending geometric patterns and the Rip Curl logo that covers the front wing. The rear quarter-light features the same pattern, applied horizontally, with the Rip Curl signature in white lettering. This graphic look firmly places the car in the surfing universe. Citroën C4 Cactus Rip Curl's increased traction promises a unique driving experience for its driver and passengers, irrespective of season and destination, while standing out clearly from the other cars with its trendy compact SUV looks.